Far away in India there is a magical tree that goes by the mysterious name of Azadirachta indica. To the layman it is called the Neem tree and the oil derived from its nuts has some pretty impressive qualities. In addition to being used for medicinal and hygienic purposes, Neem oil is also an effective natural insecticide. The naturally occurring azadirachtin contained in Neem oil is used worldwide to effectively get rid of everything from aphids to whiteflies. One of the biggest benefits to using Neem oil in the garden is that it has an extremely low toxicity in mammals. That means you won’t poison yourself, your family or your pets and you will still get rid of many of the most common garden pests. The oil coats the soft bodied insects and renders them unable to breathe. Ingesting the oil interferes with the hormones making them forget to eat or to mate. 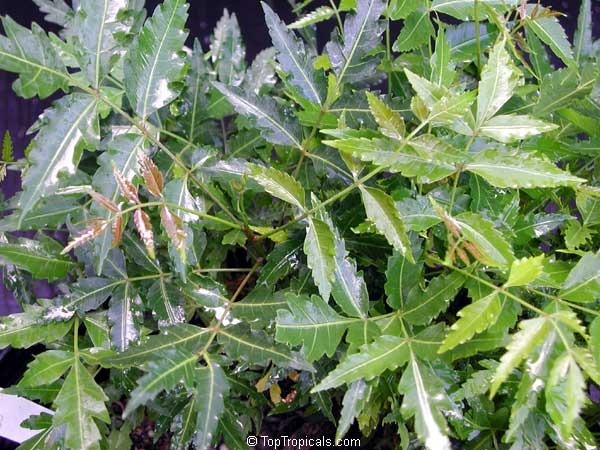 A typical Neem oil insecticide is made up of 3-4% azadirachtin in a water base and while it does the job of eradicating pests in the garden, you may have to reapply it every few days for it to reach full efficacy. What more could you ask for? Organic pest control in a naturally occurring oil that won’t harm you, your plants or your animals. It’s all there in Neem oil! will this stuff harm bees & other beneficial insects? Previous post: What Is Companion Planting?